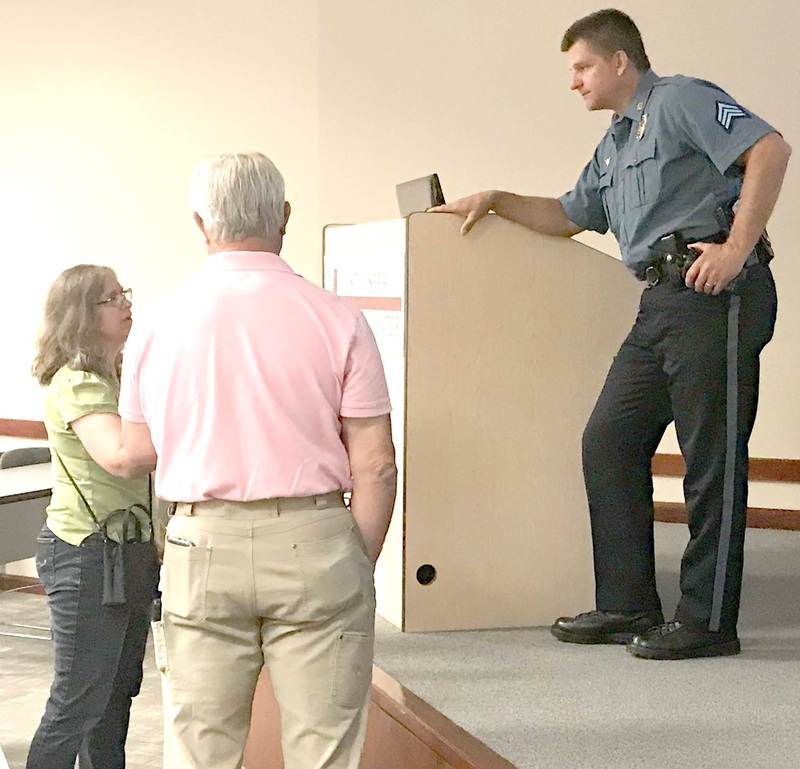 As part of the hospital’s ongoing commitment to community education, St. Joseph Medical Center last Thursday hosted the Kansas City Police Department for free active shooter training. KCPD Sergeant Steve Schramm presented to around 50 participants, focusing on recognizing and protecting oneself from an active shooter situation in the workplace or in other public settings like malls, stores, restaurants and churches. Schramm has worked for KCPD since 1995, and has worked with tactical response teams to train his department on active shooters. The department started doing active shooter drills for the charter and public schools to help develop their plan, which is no longer offered to the public. City Hall, the health and water departments, and other Kansas City organizations also receive the shooter drill trainings. Schramm said that while most of the time people know what to do for a fire or tornado drill, there has not been formal training for an active shooter situation. He added that each individual has to take ownership when it comes to active shooter training, because if the situation arises, no one will be telling everyone what to do or how to respond. KCPD focuses on Flee. Fortify. Fight. for their active shooter training. Similar to a lockdown, it provides an option to escape from a threat. The definition of an active shooter, according to Schramm, is an individual actively engaged in killing or attempting to kill people in a confined or populated area; in most cases, active shooters use firearms and there is no pattern or method to their selection of victims. Active shooter situations are unpredictable and evolve quickly. About 25 percent of active shooter instances are happening in school environments, according to Schramm. Half are occurring in the business world, including stores and restaurants or businesses that are not open to pedestrian traffic. The number-one option, according to Schramm, is to flee, or run away from the threat of an active shooter, if possible. If fleeing is not an option, fortifying, or hiding in a safe, secure location where one can barricade oneself is best. Schramm said that it is important to know where the exits are in every building one enters. Familiarizing oneself inside of a structure can provide for easy and quick exits, which could potentially save lives. In restaurants, specifically, Schramm added that there is always an exit door through the kitchen. If fleeing or fortifying are not options, Schramm said that the only thing left to do is to fight, or disengage, the threat. Using whatever is available as a weapon or distraction, including chairs, aerosol sprays, or objects that can be thrown, the goal is to stop the active shooter from creating additional harm. The Kansas City Police Department offers their active shooter training through its Crisis Intervention Team. To find out more information about the training, contact the department at 816-234-5000. St. Joseph Medical Center provides free community education classes regularly. To find out more information, visit stjosephkc.com, or follow the hospital on social media. From congratulating state champions to building comradery between neighbors, a new social media campaign in Grandview has gained popularity, and is receiving regional recognition. We Are Grandview has been seen on Facebook and Twitter (#WeAreGrandview), in newsletters and on mailers, in print and online, and was even used as the theme for the Harry’s Hay Days parade. What began as a strategic marketing campaign to try and put a positive spin on Grandview’s image has become a clear message of change and evolution in the community. A few years ago, the Grandview C-4 School District began a communication audit, focusing on how the district is perceived in and out of the Grandview community. At that time, after a conversation with some City of Grandview staff, Clarke discovered that the city was also thinking of Grandview’s perception and how to change it. Meetings began to take place to figure out how the district and the city could work together to put a brand on Grandview. We Are Grandview was born out of a cheer. Clarke said that during a high school pep rally, varsity cheerleaders chanted “we are Grandview” to help students get excited about an upcoming game. Clarke added that she often hears from people outside of the community who may have a negative view of Grandview based on untrue information. From a city standpoint, one of the biggest challenges that Communications Manager Valarie Poindexter has is surrounding that perception and image. The brand provides residents and the community an avenue to express pride in the Grandview community. Clarke said that she has seen the We Are Grandview social media conversation from people all over the country. “It really touches your heart when you see all of these great things, one after the other, these great stories from Grandview when you search We Are Grandview on social media,” said Poindexter. 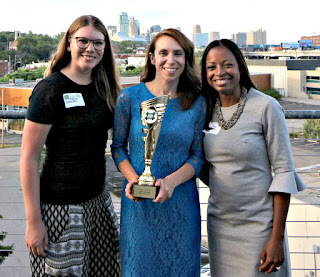 The two decided to enter their We Are Grandview campaign in the Social Media Club of Kansas City’s annual AMPS awards, which was established four years ago to recognize outstanding social campaigns from brands, nonprofits, governments and educational institutions in the region. With no budget, no social media campaign software, and with a brand just underway, Poindexter and Clarke weren’t sure they even had a shot for last year’s deadline, and thought they may have more material to enter for their 2018 campaign. They say their next hurdle is continuing the momentum they have created, and maintaining a positive brand message in the community. "We Are Grandview" is a story. It is a collective voice that defines who Grandview is as a community. It puts a face on the people who live, work, and have fun in Grandview. It is redefining what makes Grandview unique, and creating a positive buzz surrounding the community. 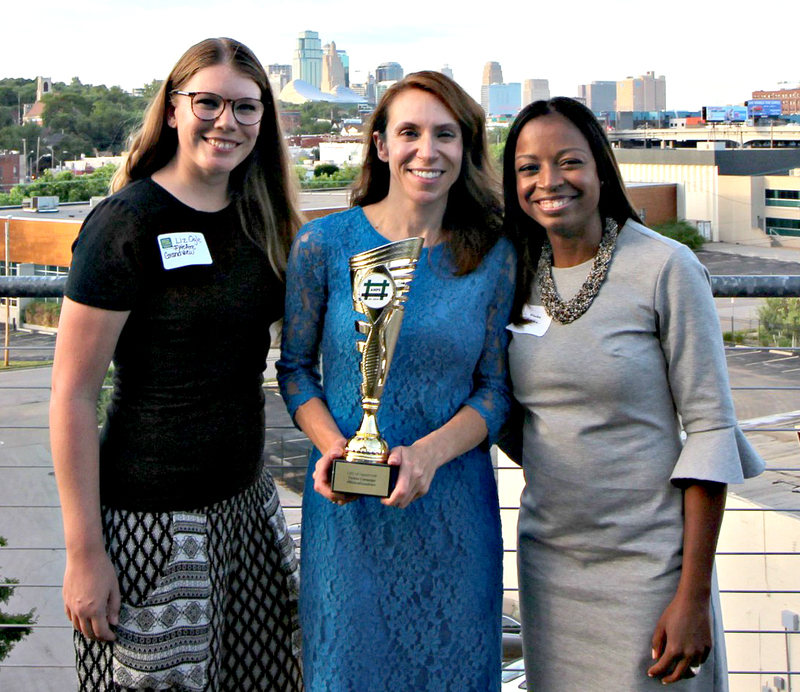 The We Are Grandview social media campaign was recognized as a gold winner on Tuesday night at the AMPS Awards Ceremony, held at Boulevard Brewery in Kansas City. With graduation now behind them, members of the class of 2018 are likely preparing to head off to college. Things like dorm room bedspreads, microwavable meals and PC versus Apple have taken priority as they set out to begin adulthood. However, one young graduate has her sights on things a little out of the ordinary for someone her age. 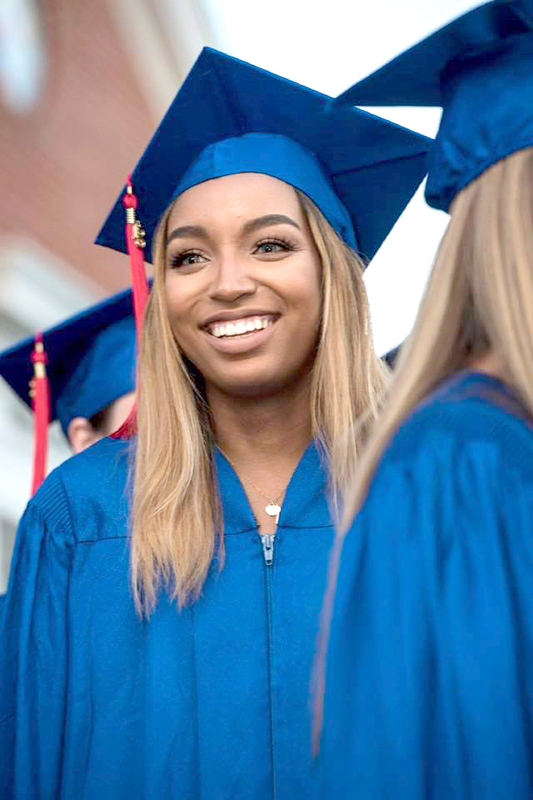 Kansas City native Arielle Nash, who spent the last four years at an elite private school, is ditching status quo and paving her way straight into entrepreneurship rather than heading off to a university for the next two, four or more years. Nash’s father, former Kansas City Councilman-turned real estate developer and economic development consultant Troy Nash, has been a major influence in his daughter’s life and ambition, exposing her to city government and the world of corporations at a young age. She has heard a lot of skepticism about her decision to forgo college, but she is determined to be taken seriously in the corporate world. One of the factors in Nash’s decision was the debt associated with a traditional four-year degree. Spending her childhood seeing women in power has inspired Nash from the beginning. Women like former Kansas City Mayor Kay Barnes, Ellen Darling, who runs the company her dad works for, and Janice Howroyd, the first African-American woman with a $1 billion business, have impacted and motivated Nash to pursue her dreams. Her company, Arielle Marie Nash Enterprises, serves as a consultant to corporations, nonprofits and other organizations to reach the millennial population. She works with companies to help employers attract and retain workforce, and then helping with branding, marketing and selling their goods to the younger generation. Through the influence of her father, Nash is also interested in real estate development. Most recently, however, she published a book, Mixed Signals: Lessons Learned Outside the Classroom, which focuses on things teenage girls struggle with like social pressures and self-esteem issues. She will be taking a trip to China to help cultivate a worldwide consulting brand. She also hopes to break the millennial stereotype and prove that innovation and change can be positive. Nash said that she has received support from both of her parents, and gives credit to her father for showing her the ropes and providing real-world education. She said, down the road, if she feels the need she will go to college, but that right now this was the best option for her. She’d like to continue to study Chinese, and will likely take classes here and there for different things, as necessary. Nash’s book is available on Amazon, and her business can be found at ariellemnash.com. 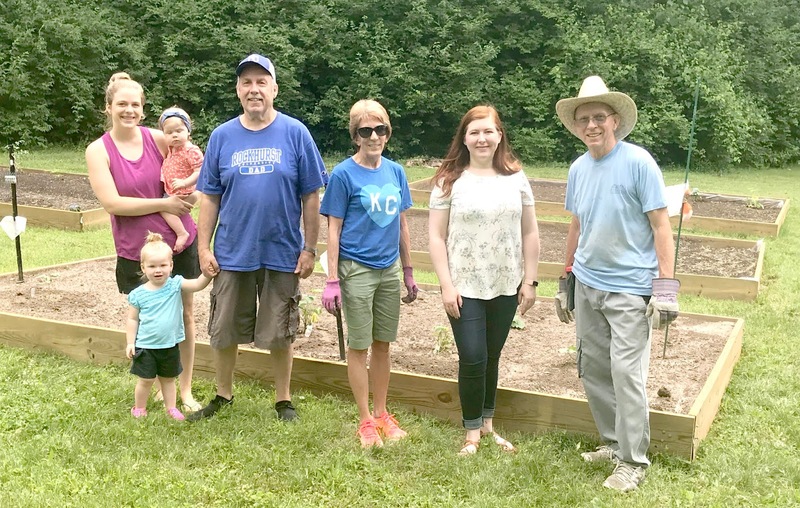 Neighbors in one South Kansas City community are sharing their love of gardening and homegrown nourishment through their collective green thumbs. Along undeveloped park land in the Terrace Lake Gardens neighborhood, resident Eilene Myers had visions of a way to utilize the unused space and bring neighbors together. The community garden has been established as a way homeowners and residents of Terrace Lake can connect with others in the association through planting. The association learned that, according to city ordinances, the shed on the park ground could not be there unless it was adjacent to a home or an established community garden. 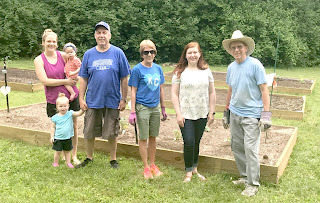 Myers, with funding help from the homeowner’s association and a few committed gardeners, rented a truck and purchased the supplies, including two full loads of dirt. Homeowners or residents of Terrace Lake Gardens can rent space in the garden on an annual basis. They are then responsible for their plot, tending to it for the season, then winterizing it and keeping it for the next year or releasing the plot for another resident. The garden is still a work in progress, and Myers hopes to expand the available plots as interest in the community grows. Myers said the response from neighbors in her community has been positive. Any resident of Terrace Lake interested in becoming involved with the community garden can contact Myers by emailing eilenemyers@hotmail.com.